EDMONTON, AB – Alley Kat Brewing has announced details of the next installment in the Dragon Series of limited edition Double IPAs. Hopped with Idaho 7, this Dragon will elevate your senses with fresh aromas of apricot and zesty orange, bringing you back down to earth with hints of pine and black tea notes. It pours a brilliant gold that’ll make even the yellowest of our autumn leaves jealous. 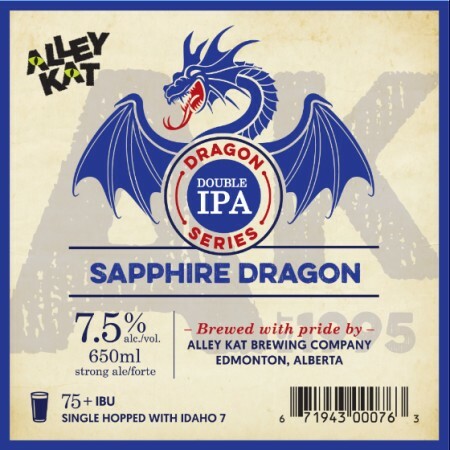 Sapphire Dragon will be launching this Thursday October 5th in a limited run of 650 ml bottles that will be available at the Alley Kat brewery store and select liquor stores and bars in Alberta while supplies last.